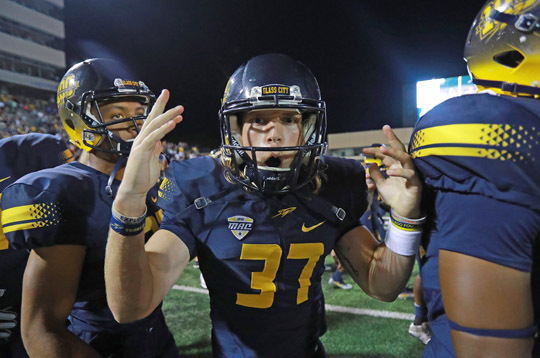 On a night in which The University of Toledo honored some of the greatest players in its 100-year history, the Rockets and senior quarterback Logan Woodside came through with a performance worthy of the ages. Woodside threw for 458 yards and a school-record-tying six touchdowns as the Rockets rallied from a 21-point deficit to defeat Tulsa, 54-51, before 24,239 joyous fans at the Glass Bowl Saturday night. 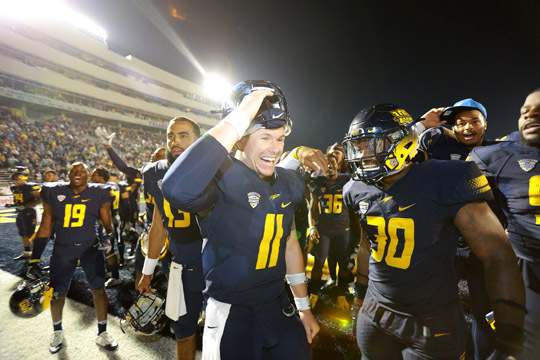 Quarterback Logan Woodside, who threw six touchdown passes to tie Bruce Gradkowski for the Toledo record, celebrated the big win with his teammates. The third-biggest comeback in the 100-year history of the program was not completed until junior placekicker Jameson Vest booted a 33-yard field goal with no time on the clock. The Rockets (3-0) trailed 28-7 in the first half, fought their way back into the game in the third quarter, then outlasted the Golden Hurricane (1-2) down the stretch. After Tulsa knotted the score at 51-51 with 2:47 to play, Woodside drove the Rockets 59 yards in eight plays, setting up Vest’s heroics. Tulsa called a pair of timeouts to ice UT’s kicker, but Vest calmly split the uprights, igniting a wild celebration on the field and in the stands. Toledo trailed 28-14 at halftime. While Head Coach Jason Candle rallied his troops in the locker room, UT honored members of its All-Century Team, named as part of the school’s celebration of the 100-yard anniversary. Among those honorees were Chuck Ealey and Bruce Gradkowski, a pair of quarterbacks who engineered numerous miraculous comebacks in their day. Woodside’s performance can now take its place among those Rocket greats. Jameson Vest celebrated after kicking the 33-yard game-winning field goal with no time left on the clock. Woodside and Vest were only two of the night’s heroes. Senior wide receiver Cody Thompson set career highs in both receptions (9) and receiving yards (178). He also caught three of Woodside’s six TD throws, including a miraculous one-armed grab in the third quarter that gave Toledo its first lead of the game, 34-31. Sophomore Diontae Johnson caught four passes for a career-best 142 yards and scored twice in the fourth quarter on bombs of 49 and 74 yards. Senior running back Terry Swanson rushed for 139 yards and one score. On the defensive side, junior safety Josh Teachey racked up a career high 14 tackles and returned a blocked extra point 100 yards for a critical two points near the end of the third quarter. Toledo’s total of 679 yards of total offense ranks fourth all-time. The two teams combined for 105 points and 1,227 yards. Wide receiver Cody Thompson caught nine passes for 178 yards and three touchdowns. The game began with a long touchdown drive by the Golden Hurricane that proved to be an anomaly for the evening, as quick scores dominated the action. Tulsa opened the scoring with an 18-play drive that soaked up 5:26 on the clock. Chad President finished off the drive with an eight-yard TD run. Toledo struck back on the very next play, tying the score on a 60-yard completion from Woodside to Danzel McKinley-Lewis. Tulsa answered, this time on 63-yard bolt from Sharmari Brooks to make the score, 14-7. Tulsa’s defense put the next score on the board when linebacker Craig Suits stepped in front of a Woodside pass and took it 37 yards the other way to make it 21-7. The Golden Hurricane extended the lead to three touchdowns when Brooks scored again, this time from eight yards out to cap a five-play, 58-yard drive. The Rockets gained some momentum going into the locker room when Woodside connected with Cody Thompson on a 26-yard TD strike with just 28 seconds left. 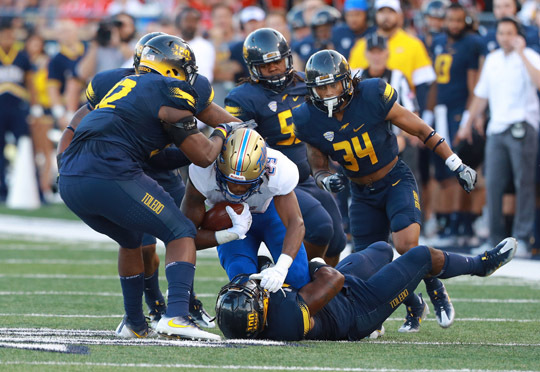 The Toledo defense came up with some big stops at the right time during the game. Toledo took the ball to start the second half and quickly cut the lead to 28-21 on a 49-yard TD sprint by Swanson. Tulsa followed with a drive that stalled on the eight-yard line, forcing the Hurricane to settle for field goal. Ten seconds later, Woodside and Thompson hooked up again, this time on an 81-yard bomb to cut the lead to 31-28 with 8:55 to play in the third quarter. The Rockets took their first lead of the game on an acrobatic one-armed touchdown catch by Thompson, his third scoring grab of the night. Woodside led Thompson into the corner of the end zone from 15 yards out, and Thompson leaped and pulled it in with one arm. The extra point attempt was mishandled, giving UT a 34-31 lead. Tulsa came back with a seven-play, 75-yard drive that was capped off by a one-yard plunge by D’Angelo Brewer. The real excitement came on the extra point, however. After Nate Childress blocked the extra point, Josh Teachey grabbed the deflected ball in the end zone and weaved his way more than 100 yards the other way for two points, making the score 37-36 in favor of Tulsa. The fourth quarter opened with a Toledo punt, followed by another touchdown for the Golden Hurricane. President broke through the right side for a 39-yard score, extending the Tulsa lead to 44-36 with 12:07 left to play. But there was no quit in the Rockets. Woodside hit Diontae Johnson with a 49-yard strike down the sideline, then followed with a connection to Jordan Fisher for the two-point conversion to tie the score 44-44. Following a rare three-and-out by Tulsa, Woodside hit Johnson again, this time on a 74-yard bomb to give Toledo a 51-44 lead with eight minutes left. 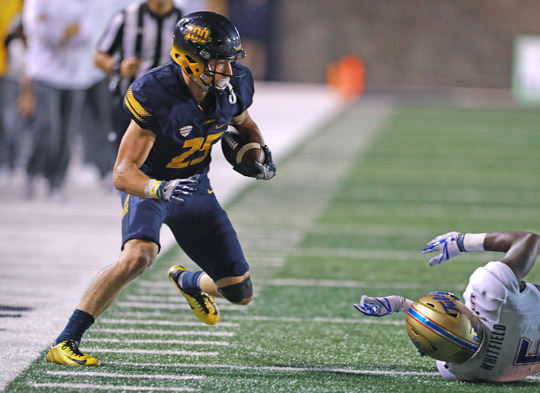 The Golden Hurricane tied it up on a 14-play drive that culminated with a one-yard TD by Brooks, setting up Toledo’s final game-winning drive. The Rockets will put their undefeated season on the line at Miami (Fla.) next week to take on the Hurricanes. This entry was posted on Sunday, September 17th, 2017 at 12:23 am and is filed under Athletics, News .